Alaskan Yellow Cedar is a specialty softwood that is distinctly different from other cedars in its color, strength and hardness. Its yellow color, extreme strength and dimensional stability have made Alaskan Yellow Cedar a favorite for both interior and exterior applications, including outdoor siding. Traditionally, Western Red Cedar has been commonly used because it can hold paints and stains better than Alaskan Yellow Cedar. 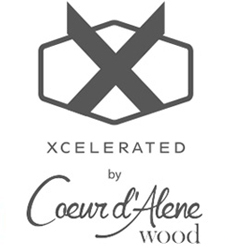 Fortunately, the Xcelerated product-line of wood does not use paints or stains, while being VOC-Free. CDA Wood’s proprietary process creates beautiful colors on the wood without adding any toxic chemicals. Plus, Alaskan Yellow Cedar is more readily available than Western Red Cedar making it a more economic choice. Alaskan Yellow Cedar is fine textured and has a straight grain. Alaskan Yellow Cedar is notable for its durability and longevity. It is naturally resistant to rot, decay, insect damage and, in saltwater applications, to marine borers. Alaskan Yellow Cedar is considerably harder than most commercially available softwoods. It resists splitting and slivering, and it is highly resistant to wear. Alaskan Yellow Cedar is structurally stable. Warp, cup, twist and shrinkage are minimal. It is easy to cut, rip, mill and sand with regular woodworking tools. Alaskan Yellow Cedar contains no pitch or resins. Alaskan Yellow Cedar is an excellent choice for exterior decks and other outdoor projects. Alaskan Yellow Cedar has beauty and elegance that will last for years. DESCRIPTION: Alaskan yellow cedar is pale yellow in color. Strong odor when freshly cut, becoming faint upon drying. Stable, moderately strong for a softwood species, stiff for its weight. Works easily, taking a good finish with hand and machine tools. Due to its strong decay resistance, it is well suited to the manufacture of boats, oars and paddles. Burl wood is rare and strikingly lustrous, with tight burl figure. Committed to Bringing You the Finest Board Products. With many projects that utilize paneling and such a variety of options to choose from, your toughest decision could be figuring out which option to choose! 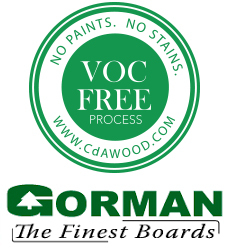 CdA Wood has set out to solve this problem by bringing our customers Gorman T & G Pine. Every piece meets the highest grading standards for strength and appearance. This lodgepole pine siding is the finest in the world and is renowned for its appearance and durability. The edges are smooth and splinter resistant and great for a variety of projects around the house or office.